The VRS clearly recognizes the serious concerns of the SLCSG, however; we urge caution in the City’s approach to mitigating the algae issue. VRS agrees that action must be taken by the City of Sudbury to resolve the long-standing issue of algae blooms once and for all; however, we differ in the recommended approach. 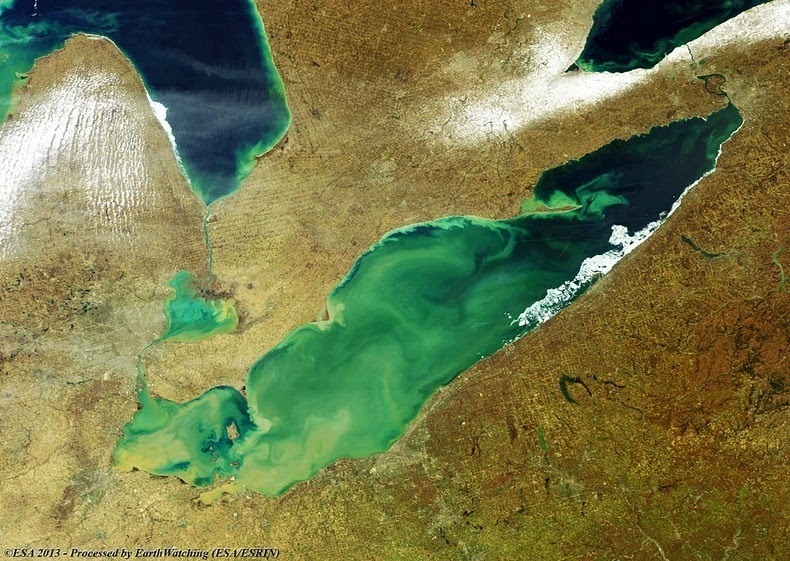 Toxic and nuisance algal bloom occurrences in Lake Erie have increased over the past decade. The blooms threaten drinking water quality, increase costs associated with treatment needs, and occasionally force closures of treatment plants. They clog industrial water intake systems, adversely impact commercial and recreational fishing activities and other recreational pursuits, and degrade fish and wildlife habitat and populations. Environment Canada solicited input on the draft target recommendations of the Great Lakes Water Quality Agreement (GLWQA) Nutrients Annex Subcommittee from June 30 to August 31, 2015. Following consideration of input received, Environment Canada and the U.S. Environmental Protection Agency will finalize targets by February 2016. Development of binational phosphorus reduction strategies and domestic action plans to meet the objectives for phosphorus concentrations and loading targets in Lake Erie will be developed by 2018. For more information about the GLWQA please visit Binational.Net(External link). Chicago, IL (June 2, 2015) – As the summer season begins around the lakes, more than 50 groups sent a joint letter to the governors and premiers of the Great Lakes states and provinces urging action to ensure the lakes, especially western Lake Erie, are free of harmful algal blooms that threaten the region’s economy, drinking water and way of life. 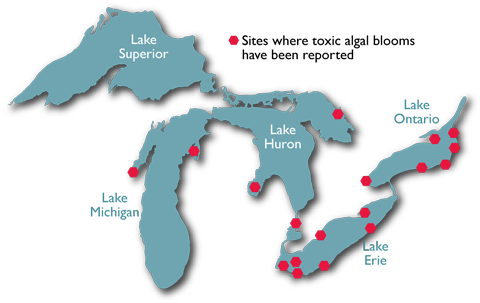 The region’s leaders will be meeting in Quebec City, Quebec for the Leadership Summit of the Great Lakes and St. Lawrence Governors and Premiers, hosted by the Council of Great Lakes Governors, on June 12-14, 2015. The Great Lakes are more than an alluring landscape – they are also a source of food and economic growth. Climate change, invasive species, habitat loss, and pollution now threaten to degrade that resource. We cannot afford to let that happen for both the sake of our economy and health. 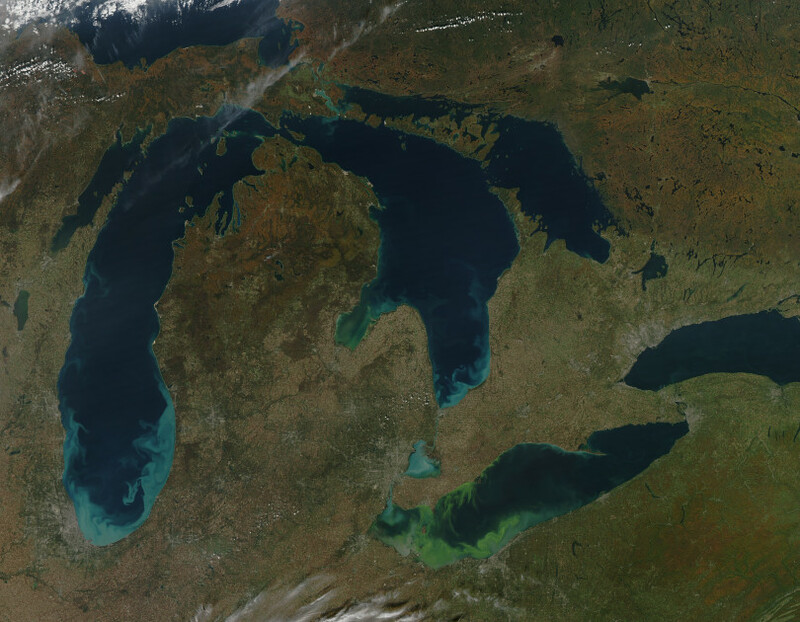 The Great Lakes economy, which supports 56 million jobs and a GDP of $5.1 trillion, could be negatively impacted by a decline in water quality. In Ontario, the Great Lakes commercial and recreational fishing industries contribute about $234 million and $600 million annually to Ontario’s economy respectively. Over 73 million tourists visited Ontario in 2010, spending over $12.3 billion. The health of 40 million people who live in the Great Lakes basin is also tied to the health of the Lakes. Over 70 per cent of Ontario residents, or three out of four residents3, get their drinking water from the Lakes, and yet toxic chemicals and other pollutants are building up in the water. Some of these harmful chemicals are toxic and could have long-term, chronic human health effects. The City of Greater Sudbury is proposing to decommission the Lively Wastewater Treatment Plant (WWTP) and upgrade the Walden WWTP. Vermilion River Stewardship (VRS) has requested tertiary treatment, which is a third means of effluent treatment, to improve water quality on the lower Junction Creek, Simon Lake, McCharles Lake, and the lower Vermilion River. VRS is making a request to the Minister of Environment to issue a Part II Order to elevate this proposal to an Individual Environmental Assessment. See attached letter. Note: This is an excerpt of the original article – access by clicking here. The federal government states that Fisheries and Oceans Canada no longer need to do this type of research. And yet when we look at the research being conducted at the ELA, the scientific data is sorely needed for a sustainable energy strategy. One ELA study assesses the effects of hydroelectric development. Hydroelectric dams are often touted as a ‘clean’ energy solution. However, the ELA study raises questions about whether hydroelectric dams have similar impacts as burning fossil fuels. An Ella Lake resident has just reported that the Blue-green Algae bloom is still persisting. So all local residents, cottagers and fishermen should continue to refrain from drinking, boiling, or using the water for the sauna. Dr. Andrea Kirkwood, Faculty of Science, University of Ontario Institute of Technology has taken a special interest in our winter outbreak, and has offered to examine a sample to determine the strain of blue-green algae present in Ella Lake. The Vermilion River had a confirmed Blue-green Algae bloom in February of 2013, and it had persisted since November of 2012. The Vermilion River Watershed has 9 City of Sudbury Waste Water Treatment Facilities releasing treated, untreated and undertreated effluent into its waters. With climate change upon us it is imperative that treatment methods be significantly improved, and that further development be restricted. 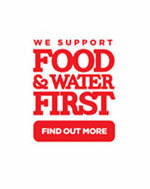 Our fresh water resources are quickly becoming one of our greatest concerns. The film below was produced by the Windsor Essex County Environment Committee in partnership with the Essex Region Conservation Authority and the International Joint Commission, this 5 minute video promotes steps we can all take to reduce the problems contributing to blue-green algae. To view news video – click here. Plus tôt ce mois-ci les riverains du lac Ella dans le Grand Sudbury ont été avisés de la présence de cyanobactéries communément appelées algue bleu-vert dans les eaux de leur lac. Normalement, les cyanobactéries envahissent le plan d’eau pendant les derniers mois de l’été. Le phénomène est surprenant en hiver. C’est d’ailleurs la première fois qu’on rapporte la présence de ces algues en plein hiver dans la région. Un résident des environs, lors d’une partie de pêche blanche, en a retrouvé par hasard au bout de sa canne à pêche. Aussitôt alertées, les autorités sanitaires ont alors distribué un avis recommandant d’éviter d’utiliser l’eau du lac pour la consommation et pour se laver. Elles ont mandaté le ministère de l’Environnement pour faire des tests approfondis. L’analyse de ces tests a été publiée cette semaine. Les résultats indiquent que la concentration de toxines n’est pas assez élevée pour être nocive pour la santé humaine. D’un point de vue scientifique, la découverte d’algue bleu-vert en hiver ne surprend pas le biologiste marin, Charles Ramcharan, du Centre pour la vitalité des lacs de l’Université Laurentienne. « Les lacs ne dorment pas sous la couche de glace qui les recouvre », dit-il. « Les organismes vivants ne gèlent donc pas et les cyanobactéries sont reconnues pour ne pas avoir un si grand besoin de lumière. Cela peut expliquer leur présence au lac Ella cet hiver », ajoute-t-il. Le Service de santé publique de Sudbury conseille à tous les riverains, de la région, d’être vigilants devant l’apparition imminente d’algues bleu-vert. Celles-ci se multiplieront avec l’arrivée des mois chauds d’été. D’après le reportage d’Olivier Charbonneau. On February 25, 2013, Ontario’s Minister of the Environment, Jim Bradley, re-introduced the Great Lakes Protection Act, the government’s first major step in implementing its Great Lakes Strategy released in December 2012. Given the central role that the Great Lakes play in the lives of the majority of Ontarians, it is expected that the Great Lakes Strategy and proposed Act will play a significant role in the province’s regulatory framework. Amidst growing concerns about the effects of population growth, new chemicals of concern, invasive species, climate change, and other new challenges facing Ontario’s critically-important Great Lakes, the Government of Ontario began pursuing a “Great Lakes Strategy” in 2009 with the release of a discussion paper entitled “Healthy Lakes, Strong Ontario.” In June 2012, Ontario issued a draft version of the Great Lakes Strategy and engaged scientific experts and community stakeholders – including First Nations and Métis communities – in a series of public consultations. This process culminated in the Ontario Great Lakes Strategy report (GLS), released in December 2012.